My eldest daughter, Eri, came back home today. She lives in Tokyo and attends a big name university. She usually uses airplanes, but this time she came back by train. I'll introduce a unique ticket of JR (Japan Railways). JR is the biggest railway company in Japan. They issue a "Youth 18 ticket", which she used this time. It contains the word "youth", but anyone can utilize this ticket, even aged people. JR has various types of trains. Some of them request additional tickets, for example an express ticket, a super-express ticket, a berth ticket,,,etc. "Youth 18 ticket" is only for ordinary trains except these trains. Ordinary trains stop at every station and take more time than express trains, so "Youth 18 ticket" is for people who have enough time. When we turn 18, we graduate from high school and some go on to universities or technical colleges. Generally speaking, they are not rich, but have a lot of time. JR wants them to travel across Japan. 18 of the "Youth 18 ticket" is named this way. As far as using ordinary trains, you have only to get one "Youth 18 ticket" per day. Eri utilized this ticket this time. Direct flights between Tokyo and Matsuyama cost 25000 yen, but a "Youth 18 ticket" is only 1600 yen. She saved big money. She left her dormitory at about 4 o'clock in the morning and got on the train at the nearest station at about 4:30. She ate breakfast, lunch and dinner in the train and finally reached Matsuyama city just before the date changed. March 26 was my hospital's duty day. My hospital was open 24 hours for emergency cases. I worked all night long at O.P.D. Though it is almost the end of winter, the number of patients with influenza is increasing in Japan. I don't know why, but anyway I saw more than 10 cases of influenza. Next, infectious gastroenteritis was impressive. The number of cases was more than 20. Some of them needed fluid replacement against dehydration. On March 27, I felt a little dizzy. I thought it might be from fatigue. A headache started in the evening. On 28th, massive diarrhea developed. I realized I had been infected with a virus, maybe norovirus. Every time I saw a patient, I washed my hands, but it seems like it was not enough. I didn't have any appetite. I drank a cup of milk at breakfast and ate unwillingly a third of my usual lunch today. It was a hard day. Mocha is our dog. He seems to be a dog who can't stand being alone. He is really smart and friendly. He can relieve our depression and anxiety. He is literally a member of my family. He gets to bark frequently these days. I think it's because no one is in the house in the daytime. He barks at anyone who goes by in front of my house. I think he is just missing people. However, his barks are noisy and scare people who don't know him. Besides, he has a tendency to lunge at people with joy. This behaviour is scary for them. We decided to have him trained by professional trainers who train police dogs. I'm expecting to see his updated intelligence. The day is coming soon. The mover came to my house and picked her goods up today. Her goods will be delivered to her new apartment on April 1st. My wife is showing her how to do household chores, like cooking, washing and ironing. I talk with her about her bank account, credit cards, college activities and anything I think she needs. I miss her and am worrying about her single life far away from home. I got to enjoy writing essays these days. I'm writing an essay about everything once a month. It takes a lot of time, but it is enjoyable. I'm making the context of the next essay up now. I'm going to express my mixed feelings about the patients who underwent my operation. Though I always do and did my best in the operation room, I'm not the best surgeon in Japan. However the patients believe me. It's a kind of honor but also a burden of responsibility. It's difficult for me to describe such emotions in English, but I'll try. I decided to throw my old skis away. I bought them 7 years ago. I didn't ski with them for these two seasons. 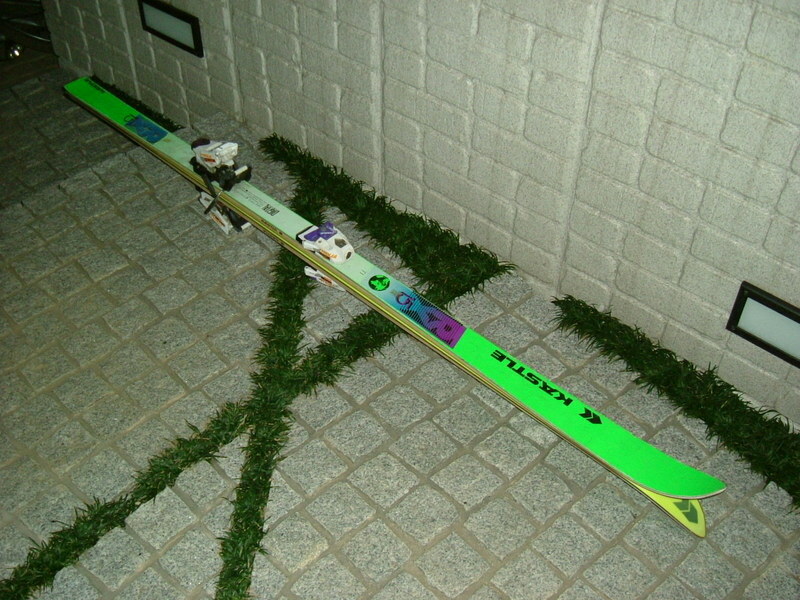 I bought the latest model of skis after a lot of hesitation last year. I went skiing with them to Whistler last year. They were a little short and it was easy to turn. I felt comfortable on them on the Whistler ski trails. The old skis that are shown in the picture did the round trips over the Pacific Ocean two times with me. While I share many good memories with those skis, the length of those skis are 185cm, which is a little long and hard for me to handle now. I took the picture of them the night before the trash truck came to collect them. Thanks a lot! For these 7 years I have been attending weekly meetings of English speaking people, who are all non-native speakers. Those members each have a purpose. Some are for their jobs, some are for amusement like watching movies, travelling abroad, etc. and some want to learn as a kind of accomplishment. Our teacher is a professor from the nearest university who is from Michigan. He has presided at this meeting for more than 15 years. I was among them for these 7 years. However, this meeting got to break up this March because his work got busy and he didn't have enough time for us. All the members felt sad to say good-bye, but I think the parting is a kind of starting. I found a nice word, "commencement". It means graduation and starting at the same time. I decided not to miss those members and become a better English speaker when we see each other next time. Though I've been learning some languages from TV programs for these couple of years, I heard that the radio programs are more condensed and at a higher level than TV programs, so I'm going to listen to radio programs in English and Korean from April instead of watching TV. The length of each program is 15 minutes every weekday. I can continue to listen because the length of those programs are suitable for me. It doesn't bother my daily work. However the on-air schedule of programs of both languages are inconvenient to me, so I got a radio with a recording function. I can accumulate the whole program into this radio and listen to it every time I'd like to. The text fee is 350 yen (about 3 U.S.$) a month. I think listening or watching TV or radio programs is a good and cheap way to learn languages. The meeting would have been impossible if their births didn't coincide in history. Only 100 years of difference in their birthdays would have made it impossible to meet each other. The probability of their meeting is extremely small because they have to live in the same era before they meet in this world. The poet sings of a glorious life experience that only occurs by chance. The poet's words make us realize how many experiences we miss. As may be expected of the poet, her way of thinking is different from that of ordinary people. 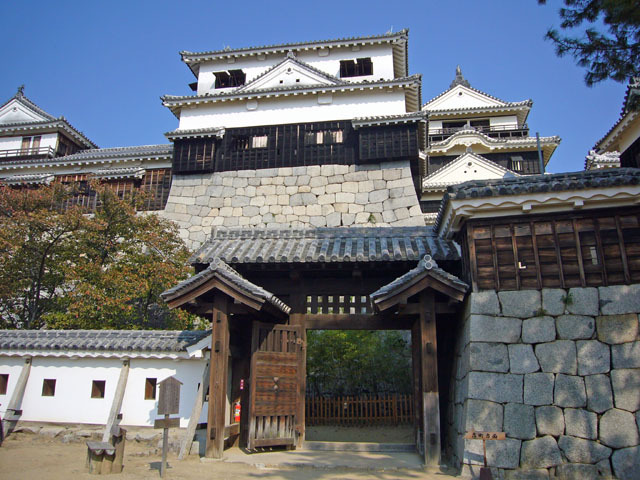 Just the other day, I found myself wishing I could pass through history and touch those that went before me when a discovery was made at Matsuyana Castle. 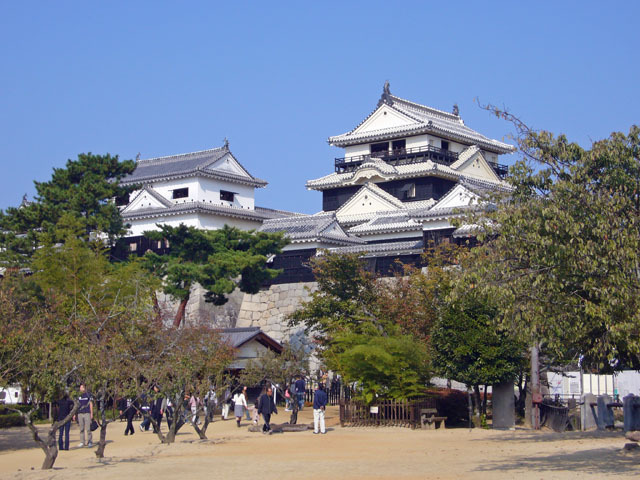 Matsuyama Castle is in the heart of my home town. It was constructed 400 years ago, taking 25 years. The original features of the castle have been maintained by timely restorations and fundamental reconstructions in every century. The castle has been under reconstruction these past 2 years. During the renovation, a lot of the castle was replaced in order to conserve the original features for the next 100 years. In the process of replacement, to my surprise, two pictures were found on the ceiling. A samurai was painted on the wooden ceiling. It is estimated that it was drawn 200 years ago. It was big, local news. Who painted it? Who is in the picture? One picture is an overhead view of a samurai's head. It might have been drawn by a carpenter who worked on the ceiling. That samurai might have been a kind of official of the renovation committee in those days. The other picture is a portrait of a samurai. I felt close to this unknown painter and the picture of the samurai. I felt a sense of fun for the painter to see the picture and thought he and I might have been good friends if I had been born in the same era. The painter and the samurai disappeared into history. I can't meet nor talk with them but if I had enough imagination, I might be able to exchange feelings with them. Human history flows all around me and I cannot touch what already happened before I was born. I happened to be born after World War 2. I am caught in the big stream of history. I'd like to visit various historical sites all over the world and talk with those who have gone before me. Can I hear the voice of Napoleon Bonaparte at Waterloo? Can I hear the voice of Robert Scott at the South Pole? Can I see famous artists like Pablo Picasso and Renoir drawing or walking at Le Bateau-Lavoir on the hill of Montmartre? What lessons can I learn from my forbearers? Good behavior is expected of all our students. The phrase "catch-22" was hard to understand. I saw this phrase in a newspaper article long ago. You can't get a job unless you have experience, but you can't get experience unless you have a job. Age 22 means the year of graduation from university in Japan. You know, the students have to get their job at age 22, so I vaguely understood the origin of the meaning of "catch-22". As you can imagine, I thought that "catch some kind of job at 22...." is something contradictory due to the reason that I wrote above. Consequently the phrase "catch-22" comes to mean dilemma. That was my understanding about "catch-22" at that time. 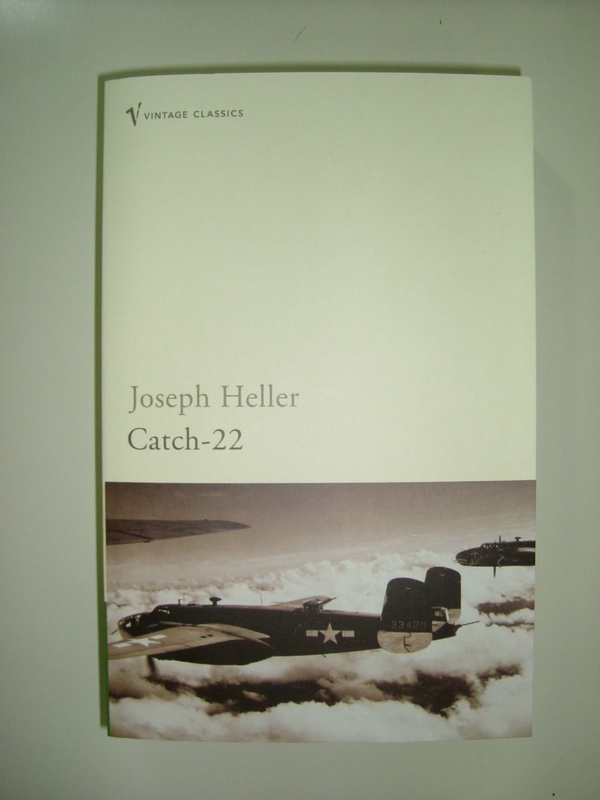 I understand the correct origin of "catch-22" from an e-mail newsletter a couple of days ago. That phrase came from a novel called "Catch-22". I found myself with this book today. I bought an English-Japanese dictionary for the first time when I entered junior high school. I was 13 years old at that time. One of my English teachers was a Spanish father. I felt a kind of exotic air in the class though I didn't have any interest in English. If I had had a keen interest in English or other foreign languages at that time, I wouldn't have so much difficulty as I have now to learn languages. 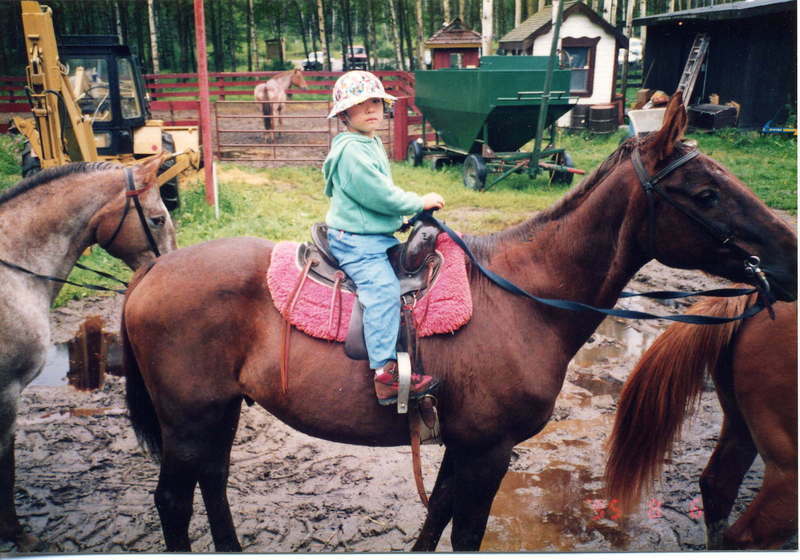 My brain must have had better memory retention when I was younger. I'm trying to write various kinds of articles now, for example diaries, essays, kind of editorials or opinions about current affairs, notes of journeys, introductory essays about my town, my hospital, my family, my hobbies,etc. I'm still learning English and I frequently make mistakes, but fortunately those articles are corrected by a teacher on the internet. Anyway I still use this old dictionary. This dictionary was the most popular and the best-selling one when I was a junior high school student. After many years, that dictionary became well-thumbed and looked dirty, so I bought a new one which was a revised version of the same dictionary. 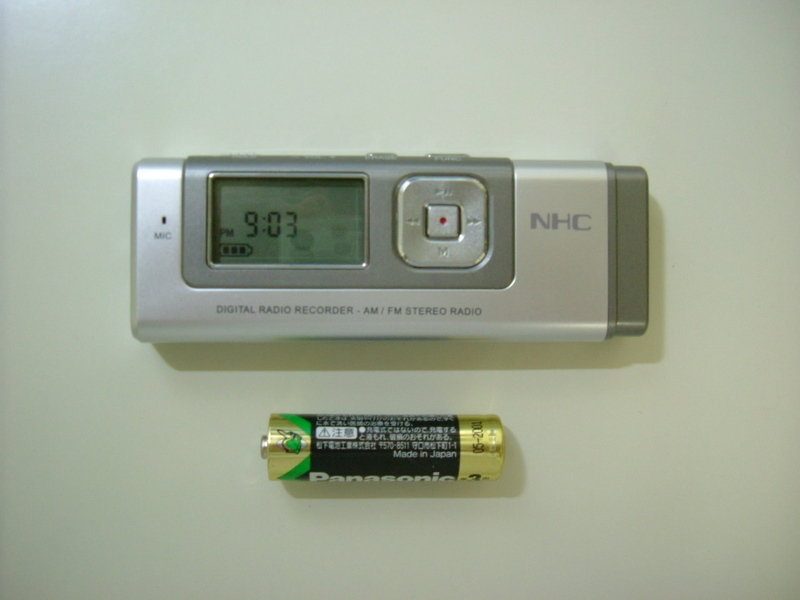 Besides, I bought an electronic dictionary a couple of years ago for portable use. I thought those dictionaries were enough for reading and writing English for a long time. The other day I found an amazing dictionary. I'll show you inside of it. I checked some phrases that I'm familiar with and I ascertained that the explanations of each phrase were precise and right. 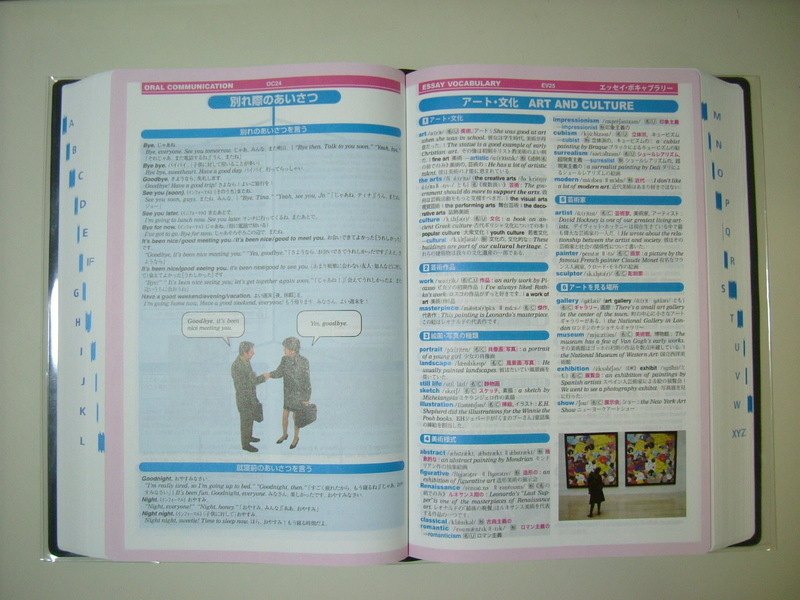 The dictionary is color printed and contains many illustrations and photos, but isn't thick. It is very comfortable to look things up in this dictionary. Moreover, you don't see the shadows of the back page. The technique of printing must have developed remarkbly during these last few decades. I'm enjoying writing this entry and looking up English words in this dictionary. I couldn't leave for Whistler this season. My friends have gone there today. I sent e-mails to them; "Have nice snow and happy days in Whistler!". Some of them replied to me from Narita International Airport. Though I couldn't see their faces, it seemed like I saw their joyful faces in their e-mails. I just enjoy looking at photos in the magazine this year. 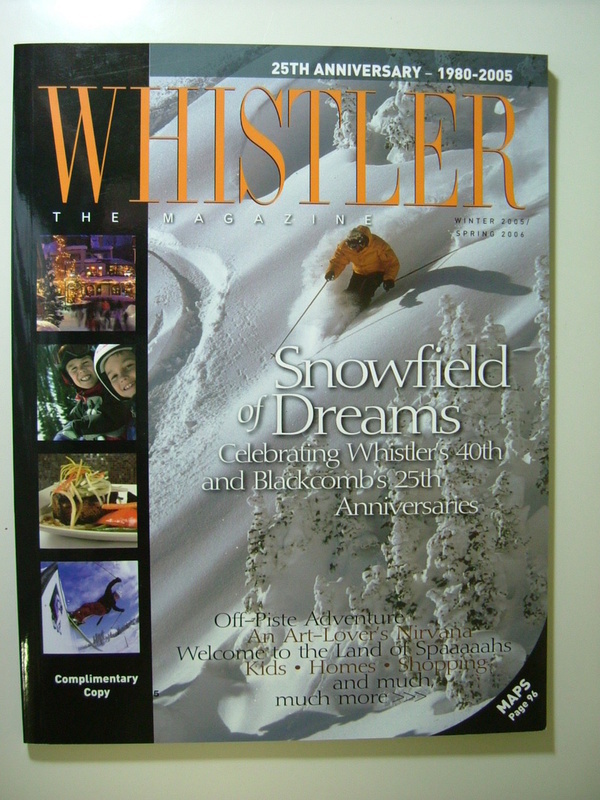 You can see the Whistler Magazine in the picture. My youngest daughter, Annlie, is on the plane heading for Australia now. It's a school trip of her junior high school. She'll visit Cairns and Sydney and have a homestay in Cairns. She was only 12 years old when I took her abroad for the first time. She couldn't understand English at all at that time. I remember that she tried to speak to a cabin attendant of Air Canada, "Could I have an orange juice?" ,which I taught her. She loves dogs and wanted to take pictures of dogs that were being walked at Whistler. After she memorized this phrase, "May I take a picture of your dog? 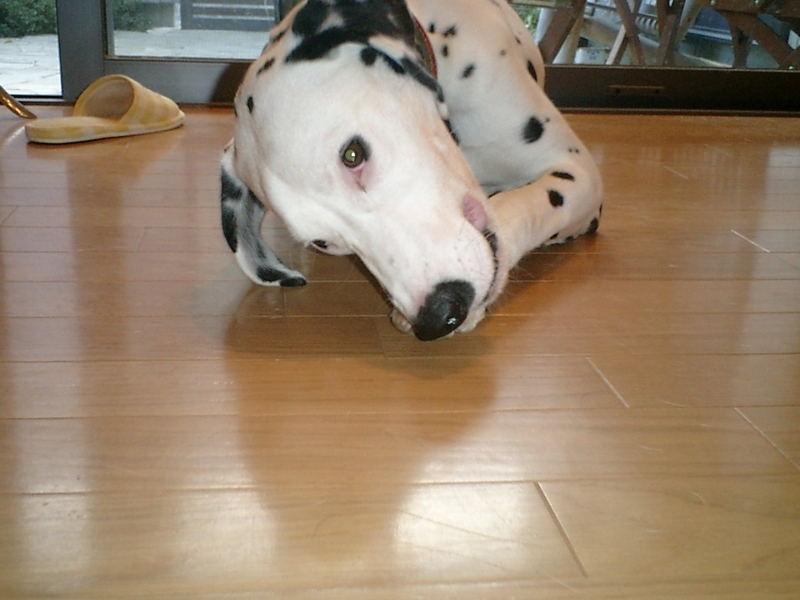 ", she took pictures of more than 30 dogs saying this phrase. Speaking in English seemed to be fun for her. Three years later, she reached the sub-2nd grade in STEP (Society for Testing English Proficiency). It's great work. She is good at English as a subject. I hope that she will be able to enjoy real communication with Australian people. She has some time before starting to learn German at her university. She seemed to have started to learn German by herself. She got some German grammar books today. When I got back home, she was pronouncing the definite articles of German in the LIVING ROOM. Because she usually studies in her room, I imagined that she was enjoying demonstrating that she had a strong will to master German. Der, Des, Dem, Den, ,,,,, She was memorising by speaking each definite article out loud. So, I said "Guten Abend! Herzlichen Glückwunsch! Ist Deutsch interessant für dich?" She was astonished to hear me speak German. It seems like she didn't know that I can speak German. It was so funny. There's a problem boy in my hospital. He is a young male nurse. His attitude towards work and duty is not good. Elderly staff members have tried to rectify his ways of thinking in vain. When I was making my rounds today, he spoke to a patient in a rude way. His rudeness was starting to annoy me. Just after the rounds, I yelled at him and I couldn't help scolding him. However, I later regretted this verbal lashing. I now know that there is no shame in making mistakes as we all make them, but the shame is in not learning from them and not forgiving others for making them. I'm treating him to some drinks at the bar in a couple of days. My second daughter, Yuri, passed the entrance exam of the university that she most wanted to enter. The university is in Nagoya, which is located a hundred miles east of Osaka and is as big as Osaka. She's going to start learning German there. She is very happy now. On the other hand, I'm unhappy. I had hoped that she would go to Matsuyama University that is 20 minutes' drive from my house. If that were the case, the cost of her living would be lower and I wouldn't miss her. Besides, I was planning to get her to apply for a driving license and buy her a new motorcycle. I was thinking of taking a long ride to Hokkaido with Yuri next summer. She chose to live alone in Nagoya rather than to live with us. It means that I have to prepare a lot of money for her. She will go on to postgraduate study after graduation from the university. I'm sorry I can't stop working as I have to keep sending money to her for at least 6 more years. I'll leave for Nagoya tomorrow to look for a dormitory or apartment for my second daughter, Yuri. It's not bad to fly to Nagoya with Yuri. It should be a happy trip, but I have some concerns. It's about the plane, which is small and so it will bounce around. I'm really scared. They say that medical doctors are rich in Japan. I don't exactly deny that. My income is above average, but you know, the really rich doctors are the owners of the hospitals. I'm just an employee. I often have impolite phone calls recently. The condominium dealers make phone calls to me at any time of the day. Not concerned about what I am doing, they call me and advise me of ways to reduce my taxes. They encourage me in an unctuous tone to buy real estate, a halfway decent condominium for tax purposes. I hate their sales strategy and impoliteness. I asked the telephone exchange operator not to connect their calls. We'll advise you of any changes in the schedule. The meeting must have been impossible if their births didn't coincide in history. Only 100 years of difference in their birthdays would make it impossible to meet each other. The probability of their meeting is extremely small because they have to live in the same era before they meet in this world. The poet sings of a glorious life like this. As may be expected of the poet, her way of thinking is different from that of ordinary people. However, I was vaguely thinking that her tale might be true. There's Matsuyama Castle in the heart of my home town. It was constructed 400 years ago, taking 25 years. The original features of the castle have been maintained by timely restorations and fundamental reconstructions in every century. The castle has been under reconstruction these past 2 years. During the renovation, a lot of parts of the castle were replaced in order to conserve the original features for the next 100 years. In the process of replacement, to my surprise, two pictures were found on the ceiling. A samurai was painted on the wooden ceiling. It is estimated that it was drawn 200 years ago. It was big, local news. Who painted it? Who is in the picture? One picture is an overhead view of a samurai's head. It might have been drawn by a carpenter who worked on the ceiling. That samurai might have been a kind of official of the renovation committee in those days. The other picture is a portrait of a samurai. I felt close to this unknown painter and the drawn samurai. I felt a sense of fun for the painter to see the picture directly and thought he and I might have been good friends if I had been born in the same era. They disappeared into history. I can't meet and talk with them but if I had enough imagination, I might be able to exchange feelings with them. Human history had already begun and I happened to be born after World War 2. I really feel that I am in the big stream of history. I'd like to visit various historical sites all over the world and talk with those who have gone before me. Can I hear the voice of Napoleon Bonaparte at Waterloo? Can I hear the voice of Robert Scott at the South Pole? Can I see famous artists like Pablo Picasso and Renoir drawing or walking at Le Bateau-Lavoir on the hill of Montmartre? What lessons can I learn from my forerunners? A young girl has been serving her apprenticeship in my hospital. She passed the official examination and became an LPN (licenced practical nurse) lately. The head nurse put a nurse's cap on her head at today's morning assembly. It's called a "Capping Ceremony" which means that her life as a nurse has just started. She looked happy and received great applause. Besides, she and another male LPN passed the entrance exam of a nursing school. They are going to be RNs (Registered Nurses). In order to do that, they have to work as an LPN in my hospital in the daytime and go to school in the evenings for 3 years. It must be hard work. I hope that they'll get an RN license. The other day, two other LPNs who had just graduated from the nursing school took the national RN examination. They are waiting for good news now. Anyway, March is a brilliant month. I got inspired by them.